Lizard Island is Australia's northernmost Great Barrier Reef Island, located 240 kilometers north of Cairns and 27ks off the coast of North Queensland. 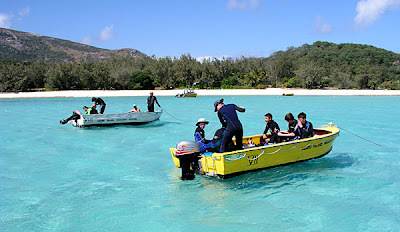 It is a granite island about 10 square kilometres in size, with three smaller islands nearby, Palfrey, South and Bird. Together these islands form the Lizard Island Group and their well-developed fringing reef encircles the 10mts deep Blue Lagoon. 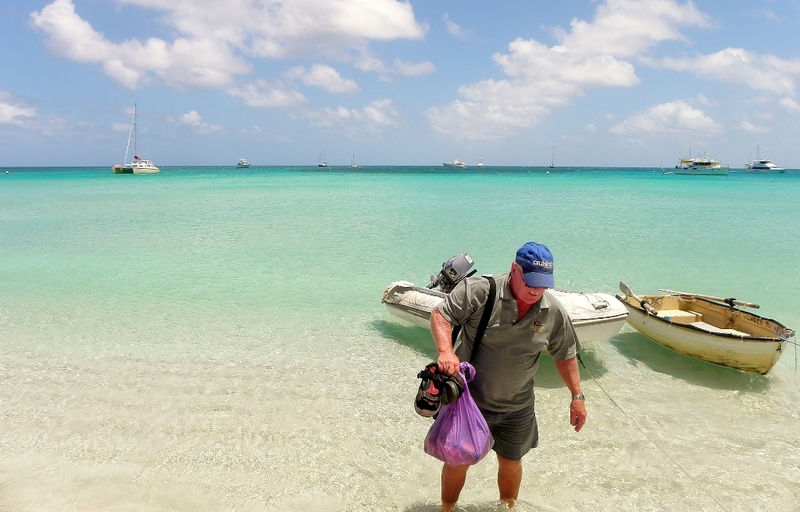 Lizard Island is a National Park covering 1,013 hectares with 24 sandy beaches and a lagoon. 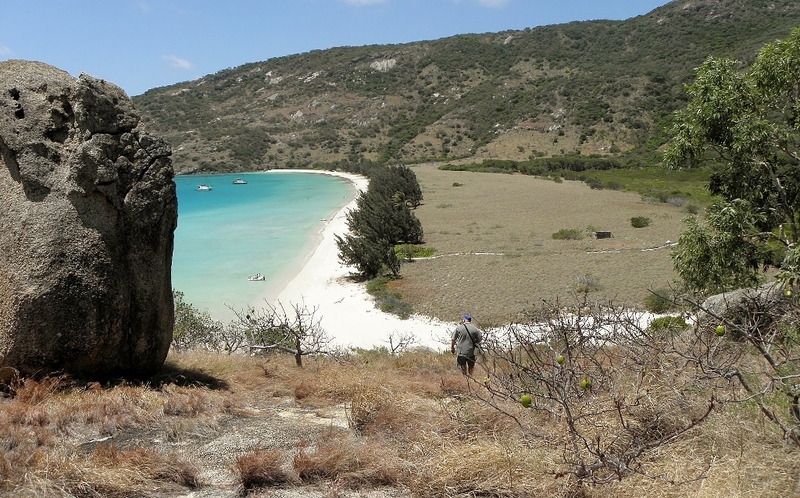 The name Lizard Island was given to it by Captain Cook when he passed it on 12 August 1770. He commented, "The only land Animals we saw here were Lizards, and these seemed to be pretty Plenty, which occasioned my naming the Island Lizard Island." 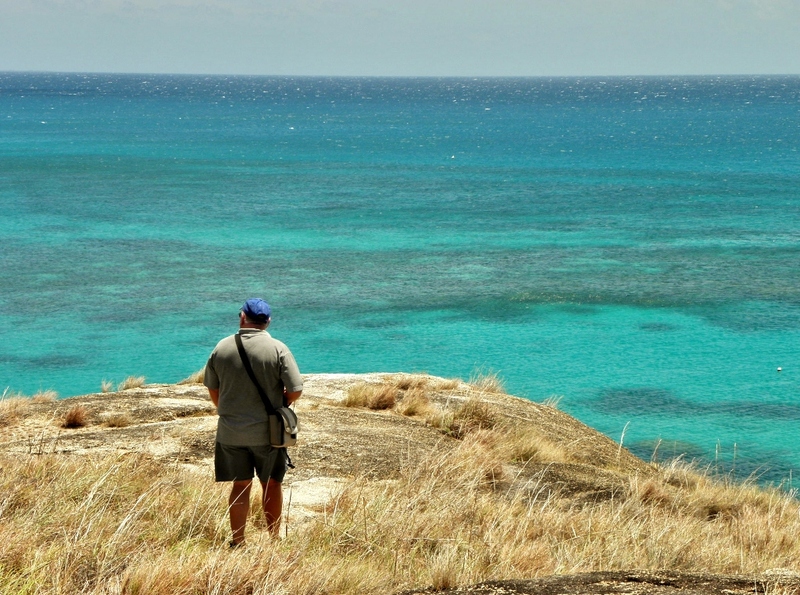 Cook climbed the peak on Lizard Island to chart a course out to sea through the maze of reefs which confronted him and the island's summit has since been called ‘Cook's Look’. The wind had not stopped blowing hard since we have arrive, it has even become worse, blowing 15’s on the first day and picking up to 20 – 25 other days with 35knts on the Wednesday night. The winds waves’ splat soundly on the hull and depending on the tide AR has been bouncing about a little. No wonder Lizard has the nickname of “Blizzard Island”. Tuesday MrJ and I manage to get ashore without getting too wet with the splashing wavelets. 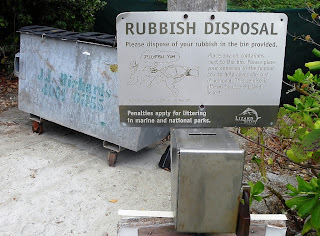 We do the walk and hill climb over Chinaman’s Ridge to the back of the Marlin Bar near the resort in the southern little bay of Watson’s Bay where boaties can dump their rubbish in a big skip bin. There is a small honor box for money, usually a gold coin, to be deposited. The Marlin Bar is also a great place to get a cold beer and meet some other boaties or some of the resort staff but only opens a couple of afternoon/evening per week. Usually a notice is posted of the opening time. Leaving the Marlin Bar area MrJ and I hike back up Chinaman’s Ridge to the two lookouts, me being very careful of my footing as the ankle is still telling me that it has not fully healed. It has been a month already since I sprained my right ankle on the South Molle walk. 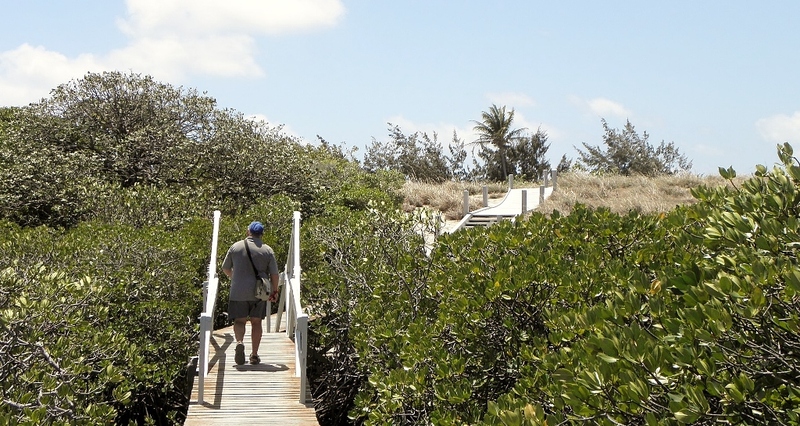 We take the same path down the other side to the track at the back of Watson’s Beach which leads us across a board walk to the ruins of the Watson’s old hut. The north Queensland coast attracted many Beche-de-mer (sea cucumber) fishermen for 100’s of years. These sea slugs were harvested and dried then shipped to Asia where they were used for cooking, a popular delicacy. By the 1880’s the trade had really grown. 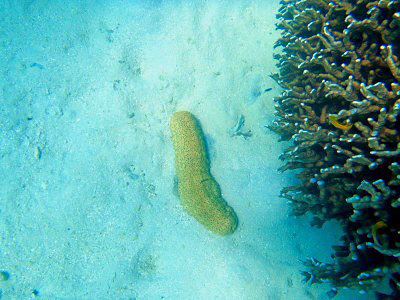 By the 1860s the island was being used by some sea cucumber fishermen who found that the waters contained substantial quantities of the creature. In 1879, Captain Robert Watson with his wife Mary Watson, two servants and baby, modified an abandoned cottage left on the island by the crew of the Julia Percy. 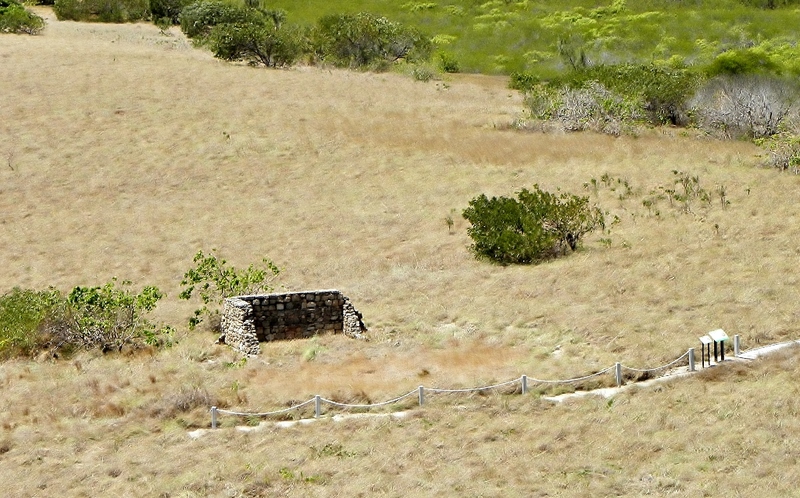 The ruins are still visible. Captain Watson was a sea cucumber fisherman and during one of his absences Aborigines from the mainland attacked their cottage killing one of the servants. 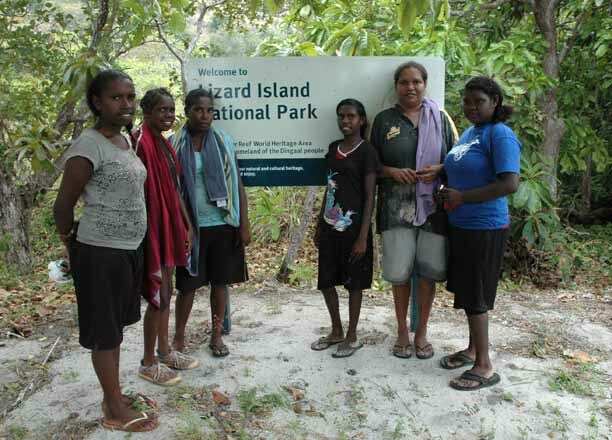 The Aboriginals were used to travelling to Lizard Island to collect Goanna and Lace Monitor lizards for their oil. Mrs Watson was only 21 when she arrived at Lizard Island and is famed for her courage and endurance. After the attack, with her four-month-old baby, Ferrier and a Chinese servant, Ah Sam, who had been wounded, she attempted to flee to the mainland in an iron boiling tank, it was a large rectangular tub used for boiling sea cucumber. The vessel floated away from the coast, some forty miles and all three died of thirst nine days later on the waterless Howick No 5 Island. Their bodies were found three months later along with Mrs Watson's diary. The State Library of Queensland holds two diaries by Mrs Watson. One is about her last 9months on Lizard Island and the other is notes documenting her last days. Mrs Watson became an emblem of pioneer heroism for many Queenslanders. In retaliation to the attack, a punitive expedition was mounted against Aboriginal groups, but they were almost certainly the wrong Aborigines. Lizard Island was known as Dyiigurra to the Dingaal Aboriginal people and was regarded as a sacred place. It was used by the people for the initiation of young males and for the harvesting of shellfish, turtles, dugongs and fish. The Dingaal believed that the Lizard group of islands had been created in the Dreamtime. They saw it as a stingray with Lizard Island being the body and the other islands in the group forming the tail. 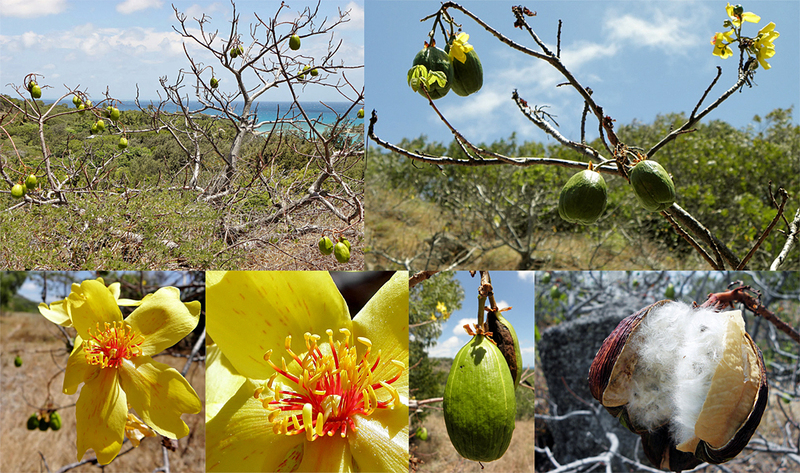 The local Dingaal Aboriginal people call the island Jiigurru. From the bottom of Chinaman’s Ridge we continued to walk along the back track, the Pandanus treack, stopping at the old water pump and camp site before crossing over to the brilliant white sands on the beach. MrJ and I found that the old water pump has been broken and no one can get fresh water there anymore. 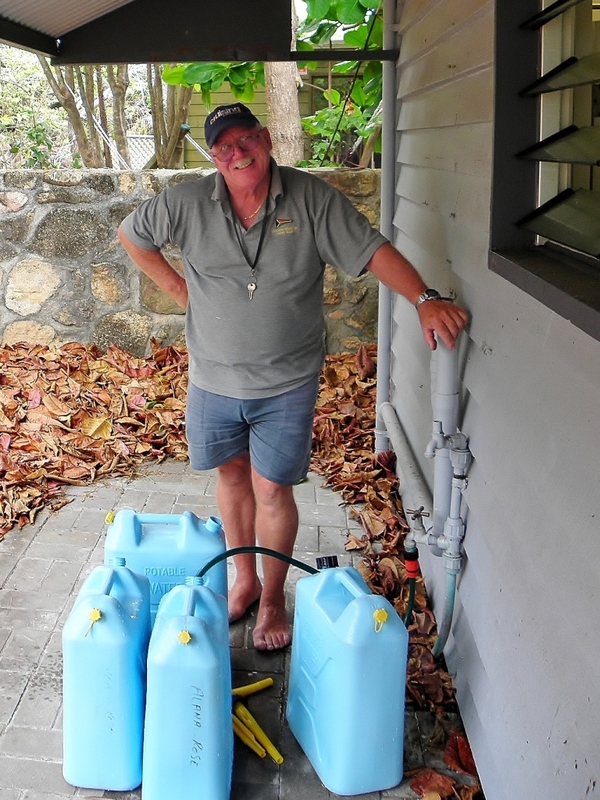 We are told late that it is possible to get fresh water from the resort if you go and ask beforehand. Situated on Lizard Island's most westerly point, the research station is operated by the Australian Museum, providing research and education facilities for those interested in studying coral reefs. As a result of research conducted at the station, about 1,000 scientific publications have been produced by Australian and international researchers since the station were set up in 1973. On the island's north western side is a small luxury five star resort. 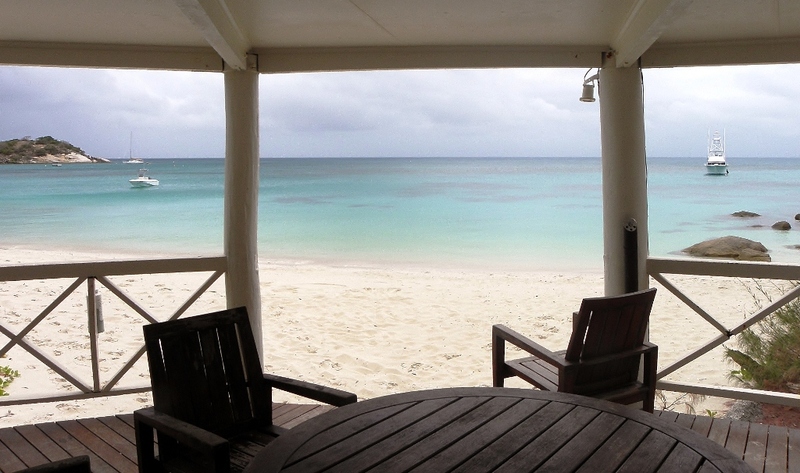 The 40 villa resort focuses on providing seclusion and water sport activities that take advantage of the island's location on the Great Barrier Reef, including diving trips to the nearby Cod Hole. The Cod Hole is one of the best known dive sites in the world and is located on the northern end of the Great Barrier Reef on Ribbon Reef #10. It is notable for and is named after the dozen or so potato cod that live there. The sanctioned feeding of these fish and number of visitors to the site has also made it a focal point in the debate over reef management. 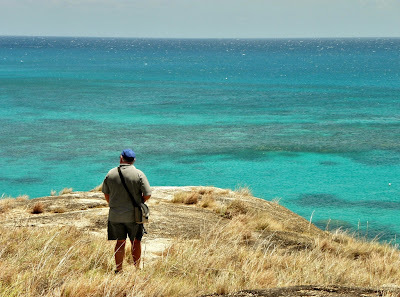 MrJ and I sailed to Lizard Island last year, we were able to do the Mt Cook climb and a hike from the end of the airfield down to the SW lagoon beach, around the sand and rock beach foreshore to the Research Station and then back overland on the sandy 4X4 track to the resort end of the airfield and home to AR. We did not get off the boat again till Friday morning as the weather would not permit. 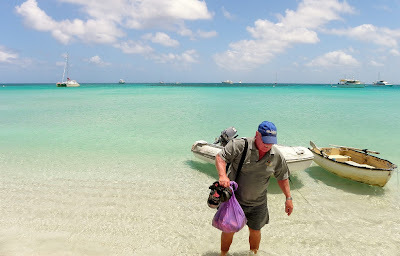 Friday morning MrJ and I braved the element, getting wet as we dinghied ashore at the beach in front of the Marlin Bar. Les off Dolphin Dance told us that we would be able to get fresh water there so we took our water jerries it and filled up. The weather has come in with rain squall but the strong winds are dying down. I think that we will be able to sail out tomorrow, Saturday for the Cape, Cape York.